Who here is obsessed with Orange is the New Black?  Me! I finished the new season approximately 4 seconds after it was released. Impossible you say? Well you’re right, but that’s not what’s important here. The real issue is I had to find something else to ease the hole in my heart where women in prison live. Next up, Wentworth. Do you know of this show? All I can say is OMG. It’s Orange is the New Black on steroids. So incredibly vicious, crazy, Australian, shocking, scandalous, and I am SO obsessed! 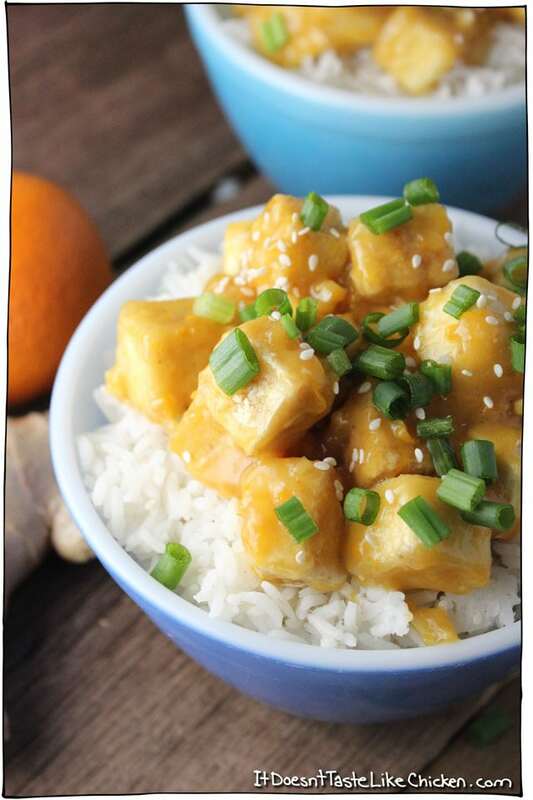 In celebration of Orange is the New Black, of Halloween, of giving the takeout boy a break, and Wentworth (even though these ladies wear not-so-bad turquoise hoodies), I bring you Orange Ginger Tofu. If you’ve tried my Sweet and Spicy Sriracha Tofu, or if you were too afraid to try it because hot sauce ain’t your thang, then you are going to love this. Sweet, sticky, gingery, orangey, kid-friendly, hide from the cold weather, curl up on the couch, and get your series watching on. Of course Sriracha could be added, for you hot sauce junkies. This recipe was inspired by my friend Kathryne who made me a ridiculously tasty orange stir-fried rice, while we drank wine, and watched Wentworth. Arn’t friends the bestest? I love how this recipe has 56% of your daily vitamin C needs and 57% of your calcium. “But where do you get your calcium”? Here my friends. Want to boost up the veggieness of this meal? Just stir-fry up some complimentary vegetables, I love bok choy, but whatever you like works great. Lay the veggies on top of the rice, and top with the tofu and orange ginger sauce. Omnomnom. 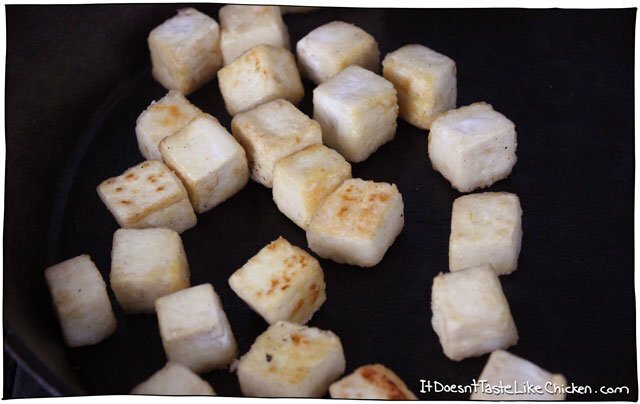 To make Orange Ginger Tofu first drain and press the tofu, then cut into 1″ cubes. 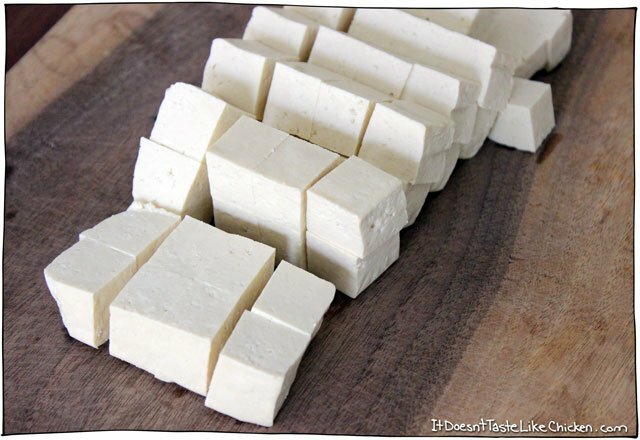 Toss the pressed and cubed tofu with the cornstarch in small batches. Shake off excess cornstarch and set aside. Fry the tofu until golden brown and crispy on all sides. A couple minutes per side. Drain on paper towel. Mmmmmmmm crispy tofu. In the meantime, make the sauce. Zest and juice the orange. Or if you are using store-bought orange juice, just zest the orange. 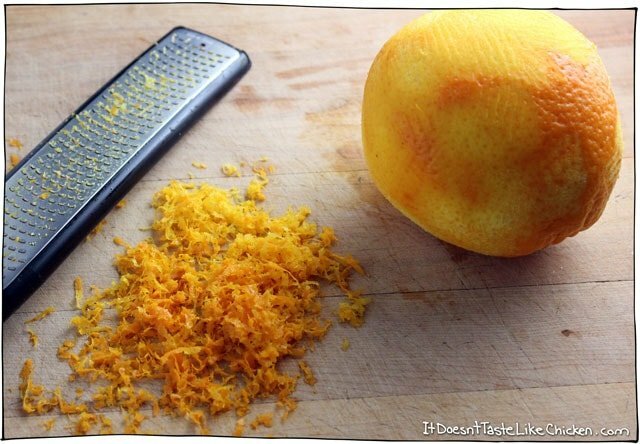 You can save the orange to eat as a snack later, or slice it up for garnish. 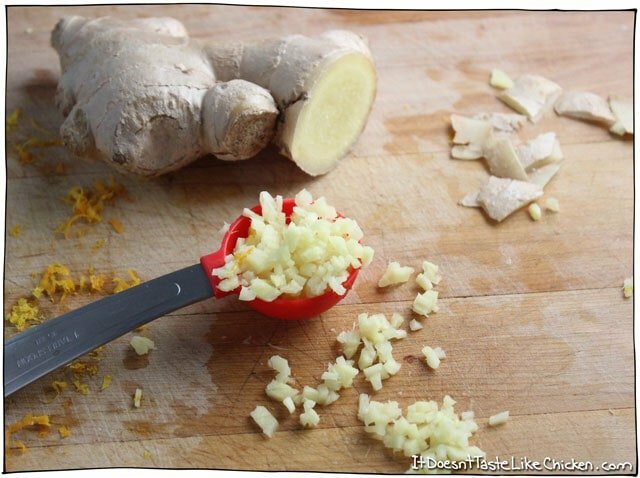 Finely mince the fresh ginger and garlic. Then add all of the sauce ingredients to a pot. Whisk well to combine making especially sure to blend in the cornstarch. 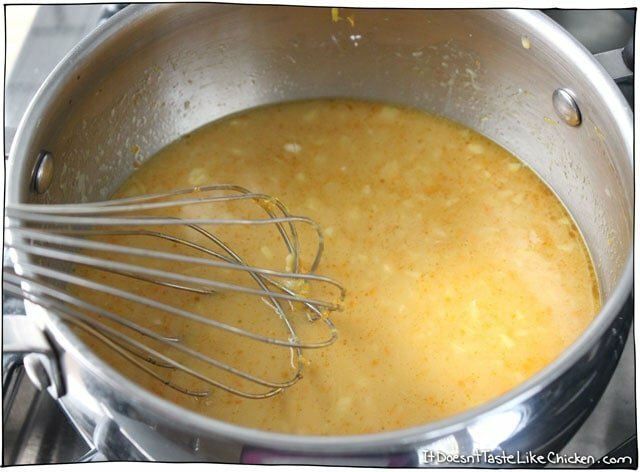 Put the pot over medium-high heat and whisk while it cooks until it thickens, it will take about 3 to 5 minutes. If your sauce thickens too much add a little water and whisk in. Add the tofu to the pot with the sauce and toss to combine. Serve over rice and garnish with green onions and sesame seeds. 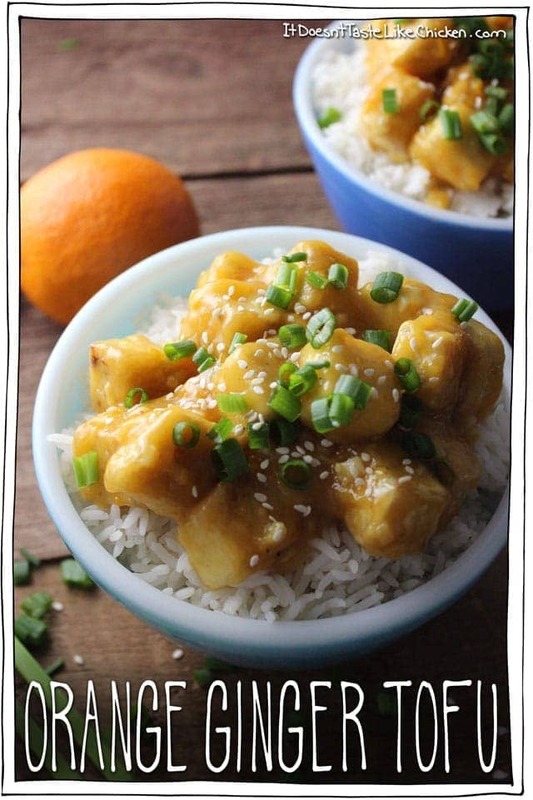 Sweet, sticky, ginger and orangey, kid-friendly. A healthier alternative to Chinese Orange Chicken. Vegan, gluten free, vegetarian. To prepare the tofu: In a medium bowl toss the tofu in the cornstarch, shake off excess cornstarch and set tofu cubes aside. 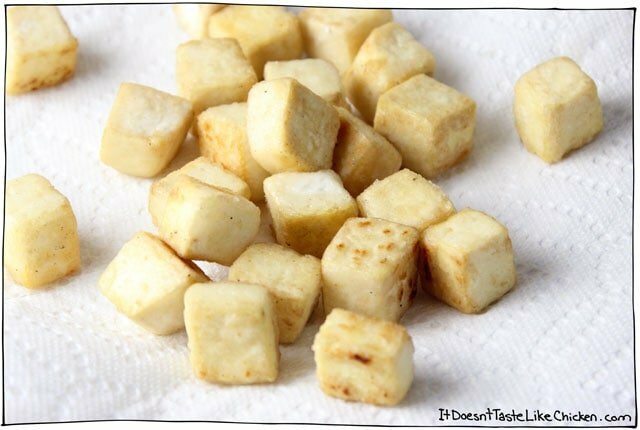 Heat the oil in a pan over medium-high heat and fry the tofu cubes until all sides are golden brown, a couple of minutes on each side. Drain tofu on paper towel to get rid of excess oil. 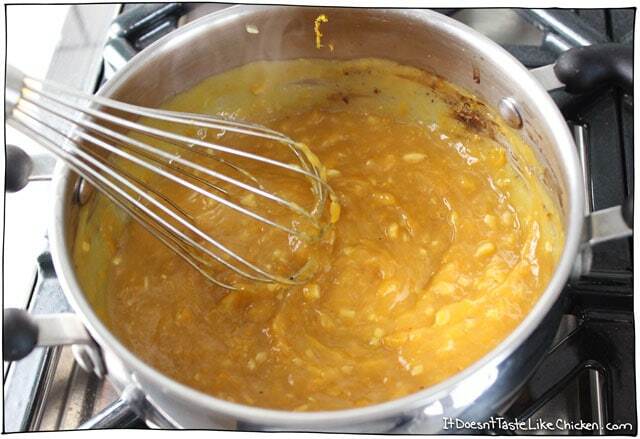 To prepare the orange ginger sauce: Add all of the sauce ingredients to a small pot. Whisk to combine, making sure the cornstarch is mixed well. Put the pot over medium-high heat and whisk until the sauce thickens about 3 - 5 minutes. Remove from heat, toss in the tofu and stir to combine. Serve over rice with garnishes. Looks delicious and I plan to try it soon. I try to stay away from oil. How long would you suggest baking and at what temp to get the same crispy result? Will try this soon! What do you recommend I add if I want to make it a bit spicier? Hi Sam! Love this dish 😀 so simple and yummy! One thing though; it might be worth being extra clear about what soy to use. I used a normal soy sauce and it made the whole thing look very unappealing and brown.. it still tastes fab but I assume you’re supposed to use a white soy sauce (if there is such a thing)? I’m a not of a newbie on Asian food so I didn’t realise. But again, it tastes fantastic! Hi Maya, so happy you loved it! Haha, I don’t know if there is such a thing as white soy sauce either! I did use normal soy sauce. Different brands can vary a lot in colour and intensity, so you probably just had a more intense soy sauce than I had. If the colour isn’t your fave, you can omit the soy sauce from the sauce, and instead use it to taste on the dish. Glad you enjoyed! Made this last night and it was absolutely INCREDIBLE. I just used the whole orange slices because i got lazy and didn’t want to juice it, but it made these yummy chunky pieces that were just so good. Seriously cant stop thinking about it. Thank you! Your blog is making me want to be more adventurous with what I cook! Thank you so much for this fabulously delicious recipe! I served it with steamed broccoli, carrots, and bok choy. Not only did I enjoy it, but my 91 year old friend did as well. She’s already looking forward to leftovers for lunch tomorrow. Thank you so much for this recipe – it looks delicious! I’ve been obsessed recently with a gingery peanut butter sauce to use in tofu ‘stir fry’ dishes, but this looks just the thing to mix things up. You wouldn’t be the first Julia 😉 Muhahahaha! Yum! I could eat tofu every day! And I have you to THANK for taking tofu to the next level by using cornstarch (I have also tried arrowroot) to make it crispier and crustier. Delish! Yum x1000!!! Can’t wait to try this 🙂 it’s the perfect take-out comfort food! Haha! Well Yay!x1000 back! I hope you love it. Looks fabiola and quick. Trying this this week. This recipe looks wonderful! I adore crispy tofu and that sticky orange sauce sounds fantastic. This will be dinner one day next week! Thank you for posting this awesome recipe, pinned!! <3 I love anything ginger and the fact that there is no meat is also great!!! The cornflour on the tofu cubes was the breakthrough I needed, thank you! Have now done over a month of plant only (plus various microbes – lets not forget the yeasts and bacteria! ), doesn’t that mean I can keep it up until I die now? Perhaps I should just get some Cup measures? 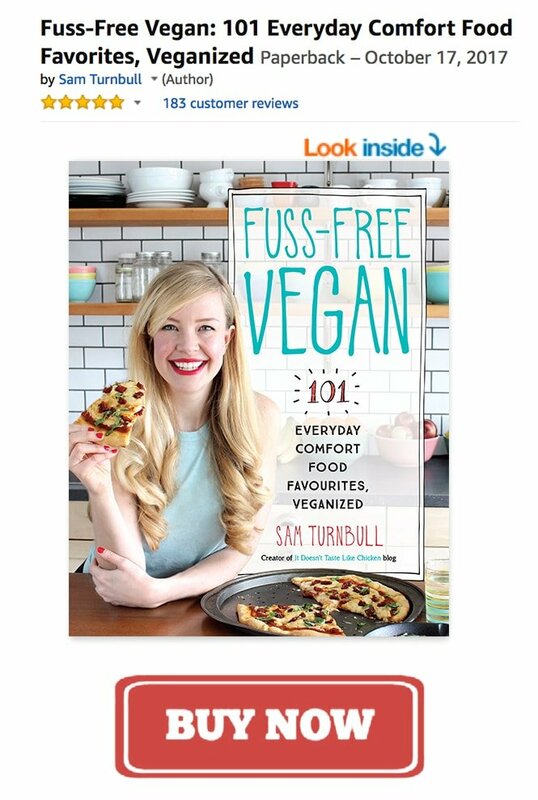 Anyway, its the enthusiasm of the new convert (or just the need to find decent vegan recipes)… this is after decades of being a domestic vegetarian, with me as the chef. Anyway, the cheese and eggs have gone. Made crispy tofu again this evening but with a ‘sweet and sour’ sauce this time (rice vinegar, ketchup, brown sugar, soy sauce & thickened with cornstarch). Crispy Tofu, you are going to be famous with this recipe! I left my post in the FBC forum link up for the first time this week and wow what a number of great posts. I can’t read them all but I’m so glad I made it to this one, I too am a vegetarian and love me some great Netflix shows with a bestie and some wine. 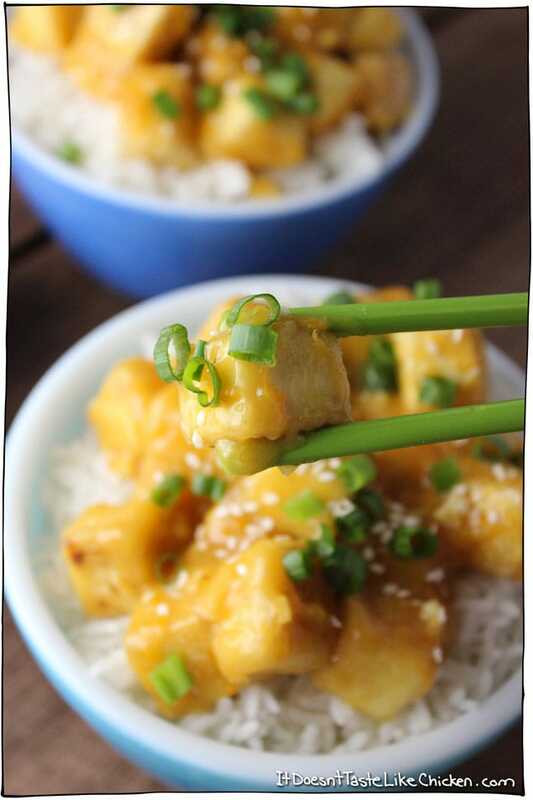 I have a great recipe for Vegetarian Chinese ‘Chicken’ Balls but would love to make this one with the tofu. You got bookmarked and am so happy I get to try this. Haha why thank you Kellie! Friends, Netflix, and wine are the best. Strike that, friends, and wine are the best. Strike that, friends are the best!! Haha. This sounds delicious and probably the only vegan dish I could ever sneak under my better halfs nose! Will have to try this soon! My stomach started growling when I was reading the recipe. If it’s vegan, it’s good. I need to get some cornstarch. Haha you’re welcome Debbie! Sorry to make your stomach growl! Haha. This looks delish! I haven’t heard of Wentworth even though I am Australian myself (shame!) but I am living in Europe so I suppose that can be my excuse 😉 I will definitely look it up. Try Wentworth! Seriously. So intense! This recipe sounds so delicious and interesting. I’m a plant-based eater too, but rarely eat tofu. I like it, so I’m not sure why — but your recipe has inspired me to use it more often. 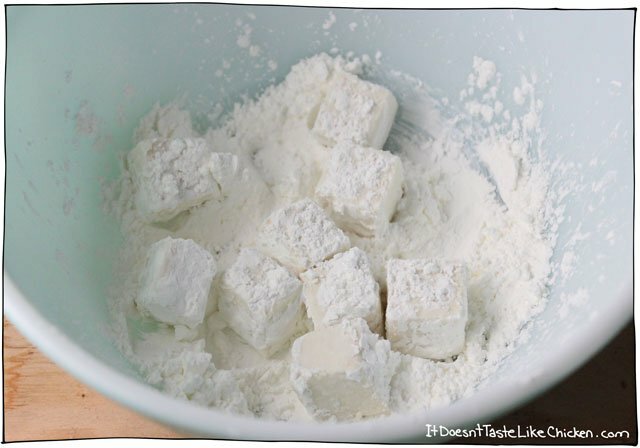 I’ve just pinned this recipe to save it for later! Thanks for sharing, and have a fantastic weekend. I hope you enjoy the recipe, and you have a fantastic weekend too! Perfect. Lunch is in 90 minutes, there is a large block of tofu in the fridge, and a hungry vegan nephew, also in the fridge. Thank you for this. It could not have come at a better time.